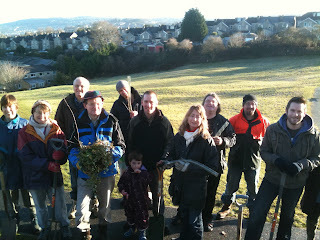 Southdown and Whiteway: Hillcrest Field tree planting. A large team of local residents, Cllrs Paul Crossley and Dine Romero and people from More Trees For Bath gathered in Hillcrest Field today to plant about100 trees donated by The Woodland Trust in Hillcrest Field. Thanks to the Parks department for providing the mulch and allowing the planting. The trees and shrubs will in about 3 years time provide a harvest of food to make jams jellies and chutnies.